A new research report from 451 Research analyzes Tango Networks' acquisition of Simetric Telecom, a leading UK-based provider of innovative mobile services and telecommunications solutions. Enterprise mobility is rapidly evolving as more businesses look to take advantage of increasingly flexible and useful mobile communications technologies. 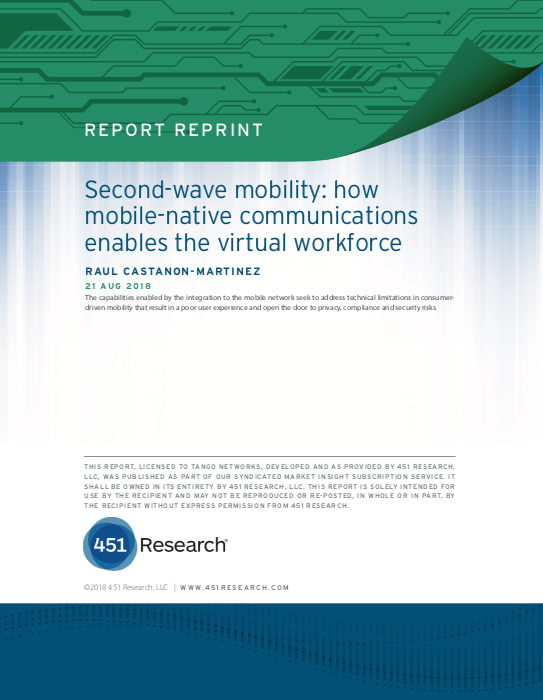 A new research report from 451 Research identifies "Second Wave Mobility" as the emerging trend of mobile technologies and services that are focused on enterprise communications needs. "Second Wave Mobility" is now taking hold in enterprises around the world. Registration is open for an upcoming webinar on evolving enterprise mobility featuring Raúl Castañón-Martínez of 451 Research.